KELLOGG'S PEP INSPECTOR CHARACTER BUTTON FROM 1945-46 SET OF 86. ELSIE “BORDEN’S CHOCOLATE DRINK / HOT OR COLD” CIRCA 1950 BUTTON BY EMRESS, NYC. “CANADA DRY/SUPER CIRCUS CLUB” WITH MARY HARTLINE LITHO ADVERTISING BUTTON. CORN CULTURE WITH THE TOWER SYSTEM CIRCA 1910 FARM BUTTON. QUENCH THAT THIRST WITH A FRESH FRUIT LIMEADE 1930s SODA JERK BUTTON. CUPID BRAND PICKLES & PRESERVES CIRCA 1900 BEAUTIFUL ADVERTISING BUTTON. 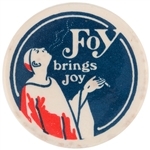 FOY BRINGS JOY ROLLING PAPERS EUROPEAN ADVERTISING BUTTON. HEINZ’S BAKED BEANS SCARCE AD BUTTON FROM 1896. CROWN WEARING HOG PROMOTES BLUE RIBBON MEAT MEAL AD BUTTON. FRANK SCHWAIGER FOR PRESIDENT SPOOF FOR BUDWEISER BREWMASTER LITHO BUTTON. MEET ME AT WILLIAMSBURG FAIR SEPT. 1,5 1917 GRAPHIC AD BUTTON. MASTER BREAD THE FRESHEST THING IN TOWN AD BUTTON. OUR PRINCESS - GREEN & De LAITTRE COMPANY BUTTON WITH WHOLESALE GROCER AD BACK PAPER. CARNATION CREAM EARLY AD BUTTON. YOU LIKE BUTTER – IT’S GOOD FOR YOU ISSUED FOR NATIONAL DAIRY COUNCIL LITHO AD BUTTON. “HEINZ” PICKLE 1904 ST.LOUIS EXPO STICKPIN. ORPHAN ANNIE 1934 OVALTINE CLUB PIN & 1971 BROADWAY PLAY PIN. KELLOGG'S PEP AIRPLANE BUTTON FROM 1943 SET. “BUSTER BROWN BREAD” CLASSIC EARLY 1900s YELLOW BORDER ADVERTISING BUTTON. “THINK GREEN / DRINK RED DOG” 1990s LARGE ST. PATRICK’S DAY BEER ADVERTISING BUTTON. “BUDWEISER 1941 3,000,000 BARREL TEAM” PARTICIPANT BEER BUTTON. “AYERSHIRES 4% COAST TO COAST” SHOWING DAIRY COW ON U.S. MAP RARE ADVERTISING MILK BUTTON. DENVER, COLORADO “SINCERITY FIRST ALWAYS BEST” CRACKERS ADVERTISING POCKET MIRROR. “I FEEL LIKE A BULL MOOSE” 1912 TEDDY ROOSEVELT INSPIRED WITH “TOKIO CIGARETTES” BACK PAPER BUTTON. “FARMERS GRAIN DEALERS OF ILLINOIS 1910” STATE FIGURAL BRASS PIN. “VOTE FOR PHILIP MORRIS” CIGARETTE CIRCA 1936 ADVERTISING BUTTON. “EAT MORE CORN” BUTTON WITH EMBOSSED BRASS EAR OF CORN ATTACHED. “IOWA” / CORN EXPO METAL FIGURAL CORN PIN PAIR. FAMOUS INDIAN CHIEF “RUSHING BEAR – PAWNEE” RED TEXT FROM 1896 PEPSIN GUM SERIES BUTTON. “ST. CHARLES EVAPORATED CREAM” COW BOTH VARIETIES ADVERTISING BUTTON PAIR. “THE GUARANTY OF PURE SODA WATER / TWENTIETH CENTURY SANITARY SYSTEMS” CHICAGO SODA FOUNTAIN BUTTON. “7-UP” AND “SEAGRAM’S 7” MOD ERA BUTTERFLY ADVERTISING BUTTON. “BUD MAN” FIGURAL PLASTIC WITH NEEDLE POST & CLUTCH BACK BUTTON. KELLOGG’S CEREAL “ASTRONAUT BREAKFAST GAME” WITH “TONY” THE TIGER LITHO BUTTON. KELLOGG'S PEP FLASH GORDON CHARACTER BUTTON FROM 1945-46 SET OF 86. HUMPHREY BOGART LARGE AND GRAPHIC ANTI-DRUNK DRIVING BUTTON. DR. PEPPER SOFT DRINK 1930s “10-2-4” LITHO SLOGAN BUTTON. CHEWING GUM EARLY AD BUTTON CIRCA 1896-98 BUTTON. “THERE’S NO CHEESE CAKE LIKE OUR CHEESE CAKE” LITHO BUTTON. “WEILANDS / THE FINEST PORK PRODUCTS” CHOICE COLOR ADVERTISING BUTTON. WENDY’S “WHERE’S THE BEEF?” ADVERTISING BUTTON FEATURING CLARA PELLER. KELLOGG'S PEP BEEZIE CHARACTER BUTTON FROM 1945-46 SET OF 86. KELLOGG'S PEP JUDY CHARACTER BUTTON FROM 1945-46 SET OF 86. "LIMETTA" SUPERB COLOR CLASSIC BUTTON. HAKE BOOK COLLECTIBLE PIN BACK BUTTONS 1896-1986 EXAMPLE USED FOR BOOK PHOTO “CROWN FLOUR” WITH KING’S CROWN AT CENTER. “TRY A JOSE CUERVO ELECTRIFYING MARGARITA” FEATURING SPIKE TOOTHED GREEN BAT BUTTON. 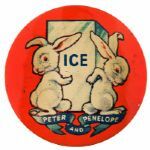 "PETER AND PENELOPE" UNUSUAL ICE INDUSTRY NEW YORK WORLD’S FAIR 1940 BADGE. LOS ANGELES COUNTY ‘CRYSTOGLAS’ TECHNIQUE GORGEOUS BUTTON. "PUSH IT" APPARENT PLUG TOBACCO AD BUTTON. "HOPPY'S FAVORITE HAWTHORNE-MELLODY" MILK PROMO BUTTOM. BOTTLERS CONVENTION 1899 EMBOSSED BRASS FIGURAL BADGE. 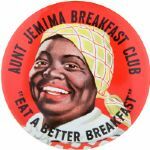 “AUNT JEMIMA BREAKFAST CLUB” CLASSIC 1950s LITHO BUTTON. "MA SNAIDER'S CHOCOLATE FLAVORED SYRUP" CUSTOMER PLEDGE BUTTON. "LET'S 'LECT LUM-EDWARDS FOR PRESIDENT" RADIO PREMIUM SPOOF CAMPAIGN BUTTON. "STAR BRAND" BUTTER EARLY AND LARGE GRAPHIC BUTTON. "'LIMETTA' HIGH BALL" SUPERB COLOR BUTTON FOR "THE DRINK OF DRINKS." TOM MIX RADIO SHOW CLUB BUTTON FROM RALSTON CEREAL.